Pearl created these lovely envelopes. She explains the how and why, "When I received the Promise Me collection, I knew exactly what I wanted to do with it. It's such a sweet and romantic collection that is the perfect touch for any card. 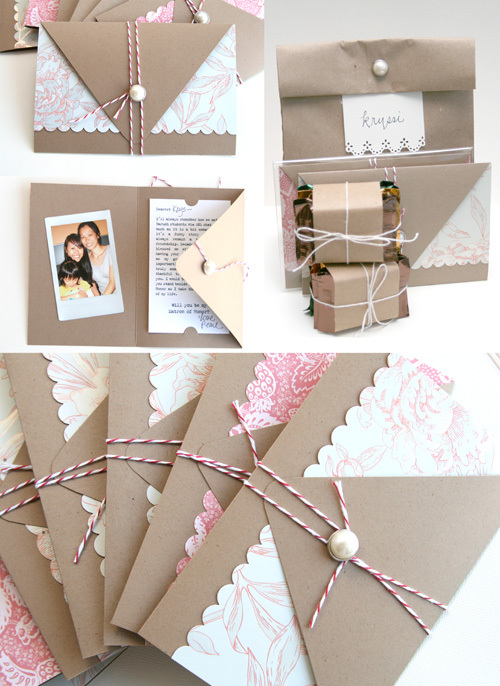 To ask my friends to be bridesmaids, I created a simple trifold card shaped like an envelope booklet." "To highlight the envelope look on the outside, I used a piece of scalloped pattern paper to contrast with the envelope flap. On the inside, I added a photo of my friend and I, along with a printed but hand addressed and signed note. To complete the envelope card, I added a pearl brad to the envelope flap and tied a long piece of double looped twine around the card. I made 7 of these and paired each with a stack of hand-packed chocolates from the city where I got engaged for a complete bridesmaid package." wow do I love these! I will give it a touch while making my own Gift Card envelopes. Lovely work, Dear...so many different styles and ideas and I love all the various mediums you've used, to give totally different looks to each.